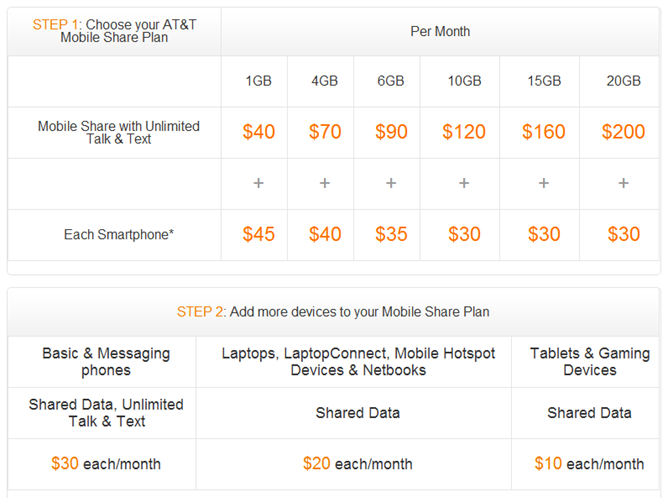 "AT&T gives customers more choice with new shared wireless data plans." That's the headline of the press release that AT&T sent out about its new shared data packages. Keywords: more choice. That's a polite way of saying "we're aiming to confuse the crap out of you." Unlike Verizon's shared data packages, which are about as simple to understand as they come, AT&T did what AT&T does best: took the simple and made it far more complex than in should be. Hopefully we can break it down so it makes sense. As you can see, the amount paid for each smartphone goes down with each bump up in bandwidth. Ergo, if you only need one geebee of data every month, you'll pay $45 for your smartphone, whereas if you use 10 GB of data, your smartphone will only cost $30 a month. Basically, the larger the data bucket, the less you pay for your smartphone. Then you can add other devices into the mix for a flat rate: $30 for feature/basic phones, $20 for laptops and hotspots, and $10 a month for tablets and gaming devices. Those fees don't fluctuate regardless of which data package you choose, so that's pretty easy. All shared data packages include unlimited talk and text. Now, let's lay this all out into a practical scenario. Say you have one smartphone and one tablet, and you choose the 6GB data package. Data will set you back $90, the smartphone is $35, and the tablet is a flat $10. Thus, you'll hand over $135 a month for your mobile usage. One more scenario, this time for families: 4GB of data, two smartphones, one basic phone, and a tablet. The data package is $70 a month, and each smartphone will cost $40. Add an extra $30 for the basic phone and $10 for the tablet, and your total monthly bill will cost you your first born child $190 plus taxes and other fees. So, how do AT&T's new data plans compare to Verizon's? They're actually pretty similar; cheaper on some levels, but more expensive on others. For example, if you have a 1GB plan with one smartphone on Verizon, you'll be paying $90 a month; on AT&T, however, the same package is $85. As the plans go up, however, that changes. A 10GB plan with one smartphone on Verizon is $140, whereas it'll set you back $150 on AT&T. The difference may seems almost negligible on a month-to-month basis, but consider this: over the period of one year, the latter plan will cost you $120 more on AT&T than Verizon. With the former, Verizon ultimately costs $60 more per year. In a nutshell: it's a crapshoot. You can't switch carriers every time you need to switch plans, so one is always going to better (or worse) than the other. Alas, there's nothing we can do to change it. This is clearly the mobile plan of the future (in the U.S., anyway), with two of the largest U.S. carriers already embracing it. Ultimately, I think the switch over to shared data with unlimited talk and text (it's all the same thing, anyway) is a good thing, but there's no doubt that the changeover is going to be a difficult conversion for many mobile subscribers. Update: AT&T just confirmed that, unlike Verizon, it will continue to offer existing packages alongside the new shared data plans. Both new and existing customers alike will be able to choose the plan that best suits their needs. Also, customers who were grandfathered in on an unlimited data plan can keep their existing package should they choose to.